In a dramatic restructuring, two teams have created versions of baker’s yeast with vastly reduced chromosome counts. For millions of years, brewer’s yeast and its close relatives have packed their DNA into 16 distinct chromosomes. Now, two teams have used CRISPR gene-editing to stuff all of yeast’s genetic material — save a few non-essential pieces — into just one or two chromosomes. The feat represents the most dramatic restructuring yet of a complex genome and could help scientists understand why organisms split their DNA over chromosomes. And, to the researchers’ surprise, the changes had little effect on most functions of the yeast (Saccharomyces cerevisiae). “That was the biggest shocker — that you can just get away with this and yeast seem to shrug its shoulders,” says Jef Boeke, a geneticist at New York University whose team jammed the yeast genome onto a pair of chromosomes1. A China-based group used a different technique to make yeast with one ‘super-chromosome’2. 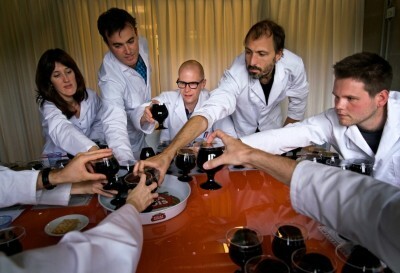 Both teams report their findings in Nature on 1 August. Yeast belongs to the eukaryotes, the branch of life that includes humans, plants and animals and whose cells store genetic material in a membrane-bound nucleus. But the number of chromosomes that eukaryotes have varies wildly and seems to have no correlation with the amount of genetic information they possess. In humans, genetic material is spread over 46 chromosomes, whereas male jack jumper ants (Myrmecia pilosula) have just 1. Single-celled brewer’s yeast — whose genome, at 12 million DNA letters long, is hundreds of times shorter than that of humans — boasts 16 chromosomes. 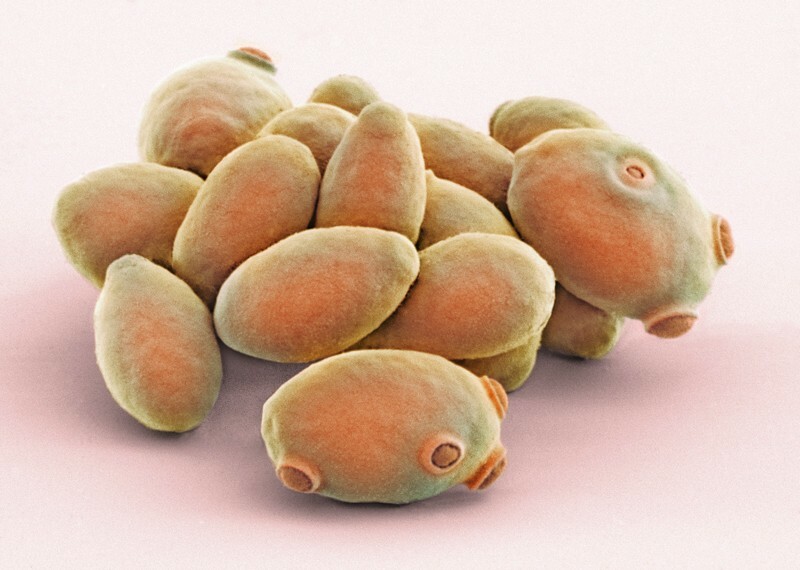 Qin and his colleagues reasoned that if an organism’s chromosome count were down to chance rather than an underlying rule of nature, there should be no reason that a yeast cell shouldn’t be viable with 1 chromosome instead of 16. Researchers in the past had fused two3 — even four4 — yeast chromosomes together, and another team split the 16 chromosomes into 33. All products had viable cells5. But no one had ever performed such extreme genetic surgery as Qin and his colleagues set out to do several years ago. Their initial attempts ended in failure — until they turned to the genome-editing tool CRISPR–Cas9, which is adept at excising specific DNA sequences. 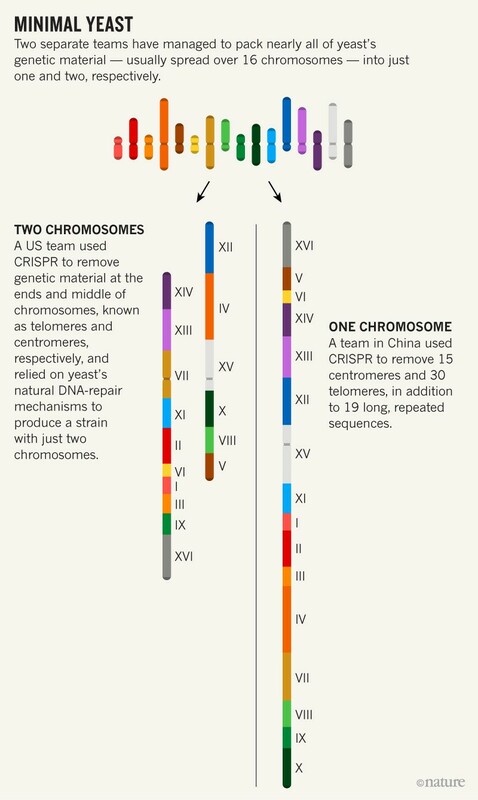 Qin and his colleagues used CRISPR to remove DNA at telomeres, the ends of chromosomes that protect them from degrading. They also snipped out centromeres, sequences in the middle that are important to DNA replication. These changes paved the way for a fit of tidying that would make home-organization guru Marie Kondo proud. The researchers first fused two chromosomes, then joined this product to another one, and in successive rounds, to another and another — until they were left with a lone-chromosome yeast strain (see ‘Minimal yeast’). One explanation for the difference is that Qin’s team also jettisoned 19 repetitive stretches of DNA. These sequences might have interfered with the mechanism that cells use to stitch two chromosomes into one, suggests Qin. Or, Boeke says, it could be down to chance: there are about 1019 different ways to arrange yeast’s 16 chromosomes into 1, and the Chinese team might simply have hit a winning combination. Both strains of ‘minimal’ yeast looked normal under a microscope, and the changes to chromosome number had little impact on their gene activity. But while Boeke’s strain underwent normal asexual reproduction and grew as efficiently as 16-chromosome strains, the lone-chromosome yeast divided more slowly. The only major defect — in both strains — was in sexual reproduction, in which yeast cells with two genome copies produce ‘spores’ that have only one. The Chinese team’s single-chromosome strain grew even more slowly compared with normal yeast when its genome was doubled through mating, and it produced fewer spores. Boeke and his colleagues observed defects when they tried to coax yeast strains with differing numbers of chromosomes to produce spores. This genetic incompatability could be used to prevent synthetic yeast, released into the environment from mating with wild strains, Boeke says. He also notes that the two-chromosome yeast might qualify as a distinct species because it can’t breed with normal yeast, despite having near-identical DNA. Scientists tend to focus on the role of DNA-sequence changes in creating new species, but these studies suggest that natural chromosome fusions could also play a part, says Gianni Liti, a geneticist at the University of Cote d’Azur in Nice, France, who reviewed the papers and wrote an accompanying essay6. Correction 02 August 2018: This article has been amended to make clear that there are about 1019 — not 10–19 — ways to arrange yeast’s 16 chromosomes into 1. Luo, J., Sun, X., Cormack, B. P. & Boeke, J. D. Nature https://doi.org/10.1038/s41586-018-0374-x (2018). Shao, Y. et al. Nature https://doi.org/10.1038/s41586-018-0382-x (2018). Neurohr, G. et al. Science 332, 465–468 (2011). Titos, I., Ivanova, T. & Mendoza, M. J. Cell Biol. 206, 719–733 (2014). Ueda, Y. et al. J. Biosci. Bioeng. 113, 675–682 (2012). Liti, G. Nature https://doi.org/10.1038/d41586-018-05309-4 (2018).